A visit to grandma and grandpa's house often found you playing outside and exploring the interesting garden plants they grew so well. "Old fashioned" flowering shrubs typically refers to those that were widely planted generations ago, but are not so commonly planted today because of newly discovered species or modern varieties with better disease resistance or other favorable qualities. Create a garden with shrubs popular in the early to mid-20th century for that old-fashioned charm. Grandma's spirea shrubs most likely only produced snow-white flowers in the summertime. Any of three different species could be grown for an old-fashioned garden. The Vanhoutte spirea (Spiraea x vanhouttei) has the greatest representation in American gardens than any other according to University of Georgia horticulture professor Michael Dirr. It's an easy-to-grow shrub that grows 6 to 10 feet tall and equally wide, suitable for U.S. Department of Agriculture hardiness zones 3 through 8. The bridal wreath spirea (Spiraea prunifolia) grows 6 to 8 feet tall and wide in zones 4 through 8. Snowmound spirea (Spiraea nipponica "Snowmound") becomes a rounded shrub with drooping branches 3 to 5 feet tall and wide, grown in zones 4 through 8. An early spring flowering spirea with and old-fashioned air is the thunberg spirea (Spiraea thunbergii), growing 3 to 5 feet tall and 4 to 6 feet wide. Certain species of lilac (Syringa spp.) grew in the urban yard or rural farmstead in the 20th century. The scented purple, pink, blue-violet or white flower clusters made wondrous bouquets. The lilac shrubs were grown as hedges or big, rounded specimen shrubs. Depending on species, lilac shrubs grow 5 to 12 feet tall and wide and are suited to USDA zones 3 through 7. Some people actually call this shrub "old-fashioned weigela" (Weigela florida). Growing 5 to 9 feet tall and 7 to 10 feet wide, this flowering shrub blooms in late spring and early summer. The older varieties most common in the early 20th century bore pink to lavender or violet-pink flowers and became rather open, gangly shrubs. Modern varieties are more compact in habit and display a wider array of flower colors. These deciduous shrubs grow in USDA zones 5 through 8, and modern varieties into zone 4. Three species of hydrageas often grew in the partially shaded areas of gardens in the early and mid 20th century. 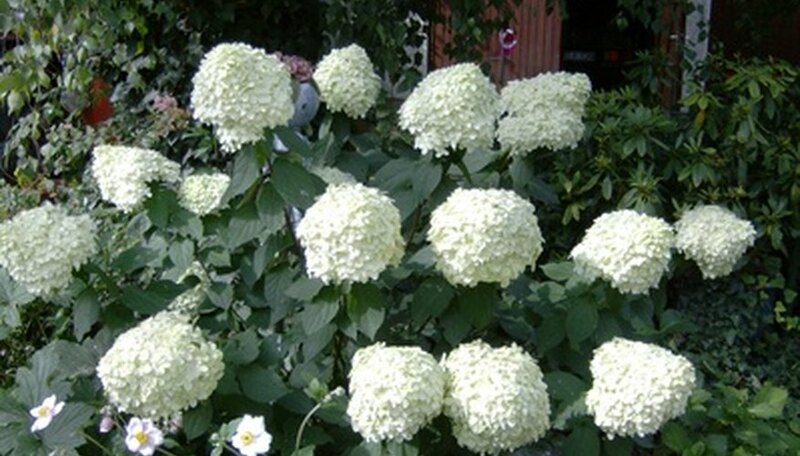 Smooth hydrangea (Hydrangea arborescens) produced massive white snowball-like flowers in summer, and one variety called "Annabelle" is a name often recalled by gardeners. This shrub grows 3 to 5 feet tall and wide in USDA zones 3 through 8. The bigleaf hydrangea (Hydrangea macrophylla) was the one that was either pink or blue based on the soil's pH. The rounded, snowball-like selections are more old-fashioned than the lace cap flowering type. In general, bigleaf hydrangea bushes grow 4 to 8 feel tall and wide and grown in USDA zones 6 through 8. Lastly, the peegee hydrangea (Hydrangea paniculata "Grandiflora") would be a large shrub grown as a hedge since it maures 15 to 25 feet tall and 10 to 20 feet wide. The rounded but cone-shaped white flower clusters were easily enjoyed in USDA zones 3 through 8.